Event in London: What shapes trends in crime? The findings of a two-year long research project on crime trends will be presented in London tomorrow (September 18). The team of academics on the project included Colin Hay, Co-director of SPERI. and Stephen Farrall, Associate Fellow of SPERI, along with colleagues at the University of Southampton. The aim of the project was to to understand the long-term trajectory of crime rates alongside relevant political, social and economic developments and interventions (paying attention to both neo-liberal and neo-conservative strands of thinking). One of the conclusions of the study is that the link between the economy and crime rates has broken down. This was reported in the Independent and the Yorkshire post yesterday. Read the press release here. The event is taking place at the Centre for Crime and Justice Studies and will answer questions from journalists, policy-makers and opinion formers about the reasons behind the rise and fall of crime. Click here for details about tomorrow’s event. You might also be interested in Colin Hay’s recent SPERI paper (free to download): The Moment when ‘Then’ became ‘Now’: Reflections on the Winter of Discontent after the Opening of the Archives. 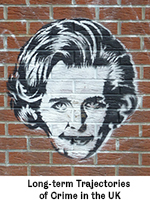 Other books of interest include The Legacy of Thatcherism, Assessing and Exploring Thatcherite Social and Economic Policies, Edited by Stephen Farrall and Colin Hay.